Less than a year after welcoming its first tenants, half of the units in a £6.8 million Lincoln tech centre have been snapped-up. The Boole Technology Centre, at the heart of the Lincoln Science & Innovation Park on Beevor Street, is continuing to prove a real magnet for innovative, high-growth companies. Of the firms that have moved into the Boole Technology Centre over the past ten months, several have recruited technical and scientific staff, including computer scientists and life scientists, from the University. 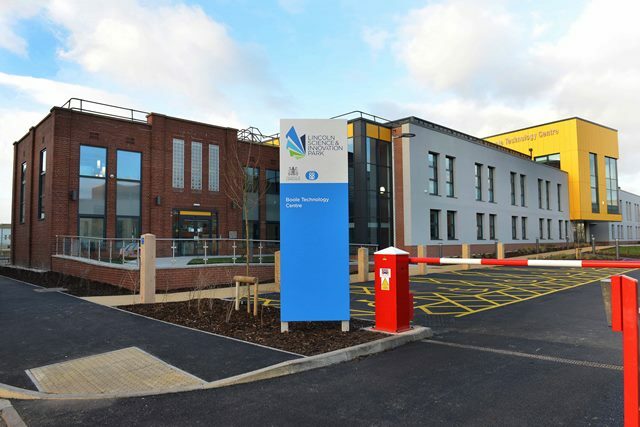 Some have moved here specifically to access those skills and the wider expertise within the Joseph Banks Laboratories, such as Arden Biotechnology,” said Mr Blount. Other tenants include Nutrapharma, a developer of new technology in the field of neutraceuticals; cyber security specialist Krypto Kloud; software developer Tenantia and Metis Aerospace, whose technology allows for the detection of civilian drones.